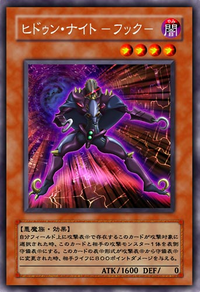 Main card page: "Hook the Hidden Knight"
When this Attack Position card is selected as an attack target, change this card and the attacking monster to Defense Position. When this card is changed from Attack Position to Defense Position, inflict 800 damage to your opponent. This page was last edited on 14 August 2017, at 19:43.